Did you know that Airborne Express had an unusual beginning? Airborne Express had an unusual beginning. It was founded as the Airborne Flower Traffic Association of California in 1946 to fly fresh flowers from the state of Hawaii to the US Mainland. Until 1968 the carrier was primarily concerned with the transportation of flowers. In order to reduce costs, the carrier developed special narrow containers which allow the use of passenger jet aircraft without needing a large cargo door modification. This was a unique approach to air freight when other carriers were using special freight aircraft. In 1968 Airborne merged with Pacific Air Freight and the focus of the business moved towards regular freight movements. The company continued for another thirty-five years when it was finally purchased by Deutsche Post and absorbed into DHL. After the merger with Pacific Air Freight, the company changed its name to Airborne Freight Corporation. This continued until 1980 when the carrier made significant changes. Firstly, the Airborne Freight Corporation purchased another air freight company called Midwest Air Charter and renamed itself Airborne Express. Secondly, the company became the first airline to purchase its own airport. The company purchased the Clinton County Air Force Base in Wilmington, Ohio and operated it solely for the use of Airborne Express. The airfield originally cost only $850,000 but the company spent an estimated $100 million to develop it for their purposes. The fact that the company had its own airport came with benefits and a number of disadvantages. Obviously, the airline did not have to pay landing fees at their airport and could adapt the airport to suit the sole needs of the airline. Of course, this meant that the costs of maintaining an airport were solely the responsibility of the airline. It is estimated that Airborne spent over $250 million in maintenance, sorting centers, aircraft hangars, machine shops, and flight simulators, during the years they operated the airport. The other uniqueness of the airline was that it used passenger aircraft rather than aircraft modified for freight. This allowed the airline to purchase commercial passenger aircraft and make minor modifications on the passenger doors to allow for the narrow cargo containers used by Airborne. No modification was required to enlarge the cargo doors. Airborne Express was always the fighting for domestic business behind the two leading carriers, UPS and FedEx. Airborne’s strategy was to concentrate on businesses that regularly ship large volumes of urgent items, and tailored their services to the specific needs of the customer. This meant that they purposely ignored those businesses and consumers who did not regularly use express mail and parcel services. The needs of some customers meant that Airborne needed to warehouse items before or after shipping, which led to the company creating the Airborne Logistics System, which offered warehousing and distribution services. 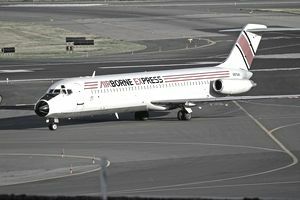 Airborne Express did have a number of strengths that could be seen as an advantage over their competitors. By having business users that shipped large volumes, the number of items picked up per stop was significantly higher than FedEx or UPS. Their aircraft were often over eighty percent full and by using independent contractors for over sixty percent of deliveries the company was able to negotiate low rates and increase revenue. Airborne was unable to make roads into the market shares of UPS and FedEx as they did have a number of weaknesses that they could not overcome. The company did start offering overnight express delivery but at first, the company offered a midday delivery guarantee rather than 10:30 am which was offered by its competitors. Airborne did change this in 2001 to offer the same guarantee. However, Airborne’s on-time delivery metrics were not as favorable as its competitors; Airborne ran at 96 percent on-time, while FedEx and UPS were over 99 percent. Airborne also suffered from a lack of sophisticated software and a very weak marketing focus. After operating as an independent company for fifty-seven years, the end came for Airborne Express when on August 14th, 2003, the shareholders of the company approved its acquisition by DHL. The ownership of the ground operations was taken over by DHL but the air operations were spun off as a separate company called ABX Air. Five years later the ground operations of DHL were discontinued closing the majority of the old Airborne Express hubs.